You’ve heard of people swarming to the city of Mecca but locusts swarming to the city Mecca? 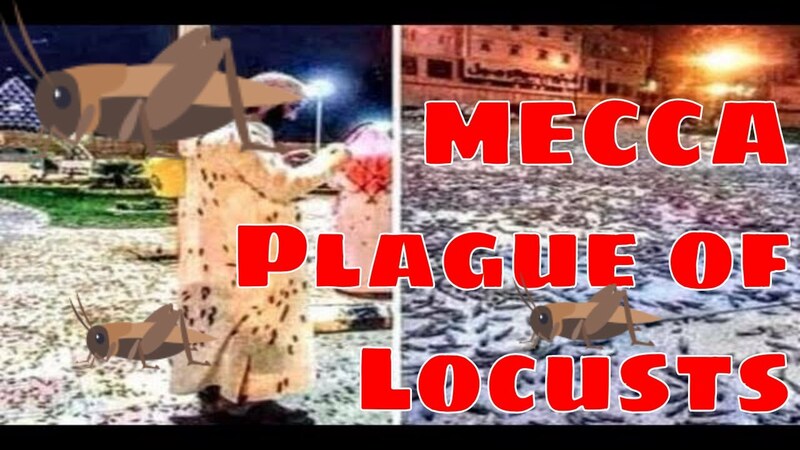 It hasn’t garnered much attention but, there were many many locusts swarming in the city of Mecca, and there may still be some causing a nuisance in and around the area. The city of Mecca is the Muslim place to be. It is probably more important than oil is to The House of Saud and The Kingdom of Saudi Arabia. According to a site called Ummid, the locusts descended on the city of Mecca on Monday, 1/7. Makkah (Mecca): In an unusual and never-before-seen phenomenon, thousands of black crickets on Monday swarmed the Holy Mosque in Makkah and major parts of the city, forcing some schools to shut down. In other reports the bugs were also referred to as grasshoppers and locusts. The bugs are said to be desert locusts (Schistocera gregaria)/ The city of Mecca is on the job. Makkah(Mecca) Municipality confirmed the phenomenon, which residents say has never been seen before, and conducted a citywide fumigation process. Many of the outlets covering the story are playing up the religious angle. Some news services are more divisive and leading than others. News reports are still coming in but, there doesn’t seem to be anything supernatural about the bugs. Newsweek quoted an Hazal bin Mohammed al-Zafar. The bugs are no good to eat.